This is a 1964 date at a large concert hall in (West) Berlin, another European date for Miles. So what? 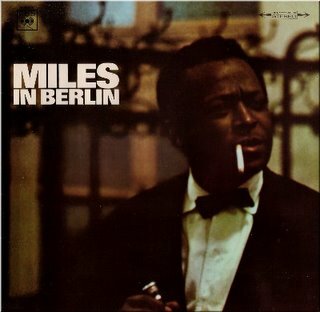 Well, it marks the first appearance on disc of Miles' exalted 'second great quintet', Shorter, Hancock, Carter and the incomparable Williams. Sadly Miles comes out of the affair pretty badly. The group storm through three Davis 'classics' and two standards in a boppish vein. Miles certainly doesn't sound like he's moved on from the 1950s recordings of these pieces, and Shorter is far too much in thrall to John Coltrane to add anything original to the ensemble. It's left to the rhythm section to provide colour and excitement. The best example of this has to be 'So What' - taken at a furious tempo, the sheer presence of Davis and Shorter is overwhelming, even if what they're playing doesnt't pass muster. But listen closely and the rhythm section really shine. Carter and Williams, particularly, appear to share some sort of telepathic communication, so sympathetic are they to each other's changes. And there are a lot of changes - Williams hardly repeats himself for more than about 8 measures out of this 10 minute piece. The level of invention and stylistic flair on show form the 18-year-old drummer is simply staggering - and better was to come! Hancock also comes out well, with some intelligently placed chords, not always conforming to the harmonies that you might expect given the slightly creaky material. Every note makes me wish I could hear the group playing one of their original compositions. I'm not sure the audience on this date agree, though, being enthusiastic in their support for Davis and Shorter while giving the rhythm section short shrift. I suppose in 1964 this sort of post-bop playing was pretty far out, though remember that this was also the year of 'A Love Supreme' and 'Four For Trane', both far more advanced than what's played here. This has to fall into the category of yet another 'transitional' album for Davis, but as a snapshot of the genesis of one of the outstanding small jazz groups it has historical interest.